We used to buy what we needed. Now we subscribe. If you live in Chicago, you can sign up for a weekly gasoline delivery subscription. For $16 a month plus the price of the gas, Yoshi will fill up your tank at home, at work, or wherever your car is parked. At the same time, you can get a $34 “monthly checkup for the Soul.” Sent by MoonBox, the spiritual and beauty items you receive are aligned to the lunar cycle. With a Quip subscription, you pay $25 (or more) for your new electric toothbrush. Then, every three months (before your bristles and battery wear out), for $5, you get a new brush head and battery. To gasoline deliveries, spiritual support, and toothbrush heads, we could add Spotify, iCloud storage, maybe Netflix… and so much more. In February 2018, McKinsey told us that the subscription e-commerce market had annually doubled during the past five years. Its popularity took them to three incentives. Sometimes we want an easy way to get refills. We also like subscriptions that bring surprises. And finally, a subscription could be the only way to get a certain discount or status. Meanwhile, businesses also benefit from the predictability of a subscription model. It gives them a better idea of their future revenue. Sellers of perishables like food and flowers can minimize waste. And firms like Rent the Runway and Zipcar can better estimate the inventory they will need. As economists, we can connect subscriptions to transaction costs. Defined as the hassle required by a purchase, a transaction cost can be extra time, money, and aggravation. However, when a subscription saves us time and money, is sufficiently personalized, and even delights us, our transaction costs shrink. It therefore makes sense that a McKinsey survey indicates convenience is a big reason we subscribe– even to gasoline delivery. My sources and more: It’s always nice when disparate topics come together. Today it was the subscription economy from yesterday’s The Money podcast and an older article on home gasoline deliveries. 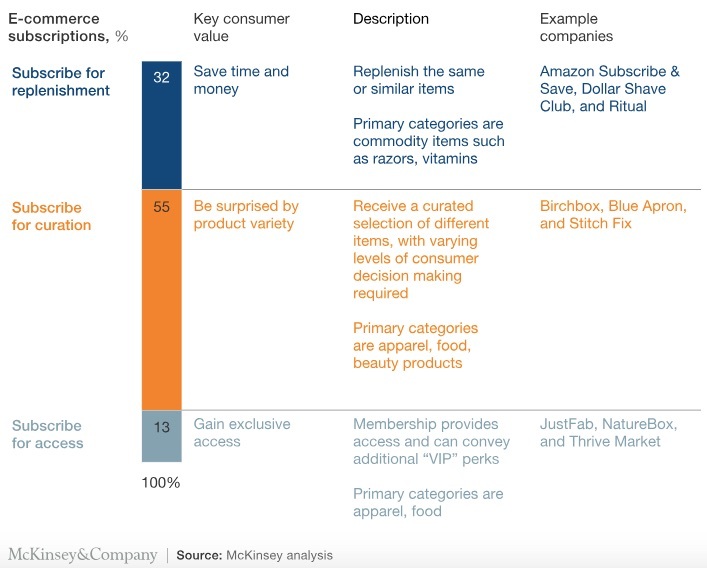 Then, you might enjoy as did I, this McKinsey analysis. Perhaps though the best story is MoverPass and how they totally misjudged their subscription model.